The Goddess Shodashi or Maha Tripura Sundari is the third of the 10 Dasa-Mahavidya, she is considered to be the highest aspect of the Divine Mother. The worship of Maha Tripura Sundari is said to be the worship of the Purest Form of the Supreme Consciousness, the one that transcends every other form of consciousness and goes beyond everything. She is the Goddess worshiped by way of the Lalita Sahasranama by devote Hindus all over the world for varied purposes, including material and spiritual ones. She is also the Goddess represented by the Great Sri Chakra or the Sri Yantra also called as the Maha Meru. The great Adi Shankara wrote extensively about the need to worship the Goddess to reach higher and higher levels of consciousness and the awakening and upwards movement of the Kundalini Shakti towards the Crown Chakra. The words of one of the greatest exponents of Advaita or the Non-Dual Philosophy of Existence should be taken very seriously by those contemplating upon the worship of this form of the Shakti or the Divine Mother. She is normally visualized by devotees as being unbelievably beautiful or the one who has a lion as her mount. However, advanced spiritualists and Yogis might have their own personalized mental image of Goddess. 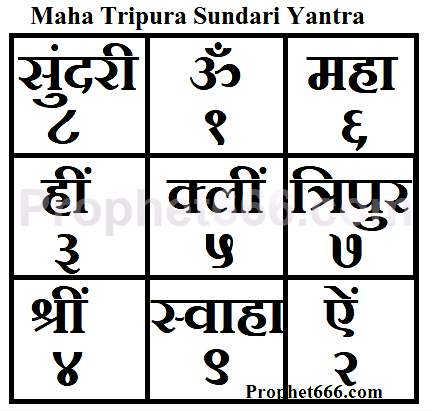 After writing the Maha Tripura Sundari Yantra, the Sadhak should chant the Maha Tripura Sundari Mantra given below. 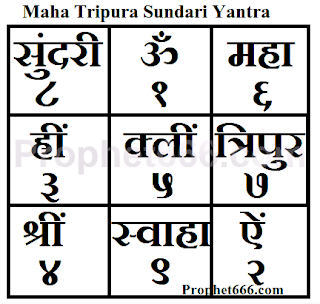 The regular worship of the Maha Tripura Sundari, by following this particular method is said to be Sarva Karya Dayak or the one that fulfills any need or desire. Note- This is an advanced form of worship of the Mother Goddess and if you are a layperson, then you should take the guidance of an experienced and learned person before attempting this Shakti Yantra-Mantra Sadhana. I think the post is incomplete, you have directly posted from line"After writing the mantra" But have forgot to give details like where to write on Bhojpatra or copper? and how many times to chant the mantra etc? As this is an advanced Mantra Experiment and has to be done under the guidance of an experienced Sadhak, that part is left out and only the basic method has been given.